Beijing, sometimes also referred to as Peking, is the political, cultural and educational center of China. It is also one of the biggest cities in the world and will be hosting the upcoming Olympic Winter Games in 2022. 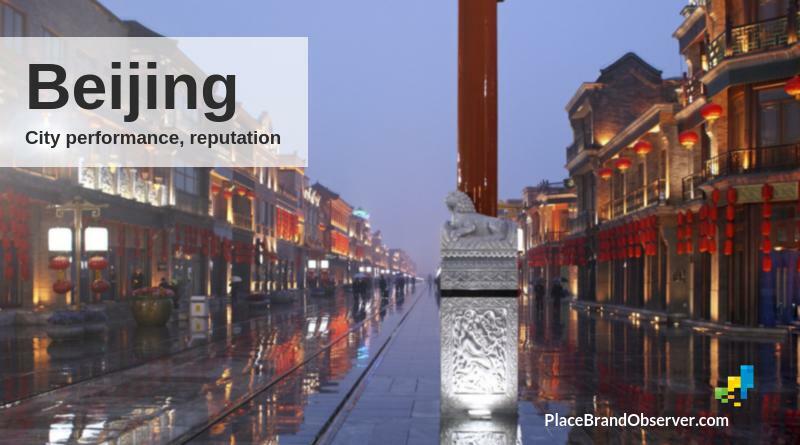 But how does Beijing do in terms of city performance, brand strength and reputation? According to the Ipsos Top Cities 2017 list Beijing is the 6th best city to do business in. There are a lot of state-owned and foreign companies based in Beijing. By 2015, Beijing was home to the headquarters of 52 companies of the Global Fortuna 500 list. This is the largest number in the world. Nonetheless the city is still ranked only 119th (out of 231 global cities) in terms of mobility exchange (Mercer Quality of Living). It is in the field of banking, Beijing performs best in. According to the Global Financial Centres Index, Beijing ranks 7th in the field of banking. The top 4 of the biggest banks in the world are located in Beijing. Other financial areas which the city performs well in, include insurance (14th) and investment management (9th). Overall, the city finds itself in the 8th position. This is a leap of 3 spots ahead. The Sub-National Human Development Index ranks cities along three dimensions: education, health and standard of living. Beijing does not just rank highly within China, it also ranks highly globally. The inhabitants enjoy a vast network of infrastructure from which to go to other parts of Beijing, China or abroad. The Beijing Capital International Airports is the 2nd biggest airport in the world in terms of passengers (Airports Council International). It is also ranked the 5th best city in the world for airport connectivity, according to the Best Cities Index. The city has many sports locations, due to the Olympic Summer Games that were held in 2008 in China. Some of those will be used again for the winter games in 2022. Besides, there is a lot of culture to enjoy. Hence, especially artists rank Beijing highly. The city performs very well in the field of cultural interaction, according to the Global Power City Index. A healthy, environmentally sustainable city? The downside of this thriving city is the effect on the environment. Beijing is a heavily polluted city. Its low position in rankings measuring urban health and sustainability is in stark contrast to its good marks for economic performance. For instance, one study considers it the 24th most polluted city in the world, and the most polluted in China (Pollution Index Rate). In the Green Index Report China is called ‘the factory to the world’, which to some degree might explain its poor environmental condition (the Sustainable Cities Index puts Beijing 85th out of 100 cities for environmental performance). Nonetheless, the government has done efforts to reduce air pollution. The city introduced the Euro IV standard prior to the Olympic Summer Games. These are legal requirements governing air pollutants released into the atmosphere. Beijing was the first city to do so in China. Despite the growth in numbers, Beijing is considered the safest city in China. The results of the Safe Cities Index 2017 show that Beijing performs better in terms of safety than most other big cities with more than 15 million inhabitants. That does not mean there is no room for progress though, since some other big cities rank higher than Beijing, and the city finds itself only in the 32nd position globally. Beijing is widely known as an important economic hub of the world. This comes with an environmental downside, but the city has a lot to offer culturally and is becoming increasingly more accessible. In addition, the city represents mobile innovation and the future. In an insight blog by GFK, Beijing is described as follows: ‘You can do without a wallet in Beijing these days but not without a smartphone.’ Beijing and China’s engagement with mobile services might be a blueprint for other countries and societies to follow suit. Prepared by Sam Jongeneelen. Last updated March 2019. Enjoyed this snapshot of Beijing’s city performance, its brand strength and reputation? Spread the word!